Venture investment in space technology is hitting stratospheric heights in recent quarters. But investors in the sector are betting it will rocket higher still. 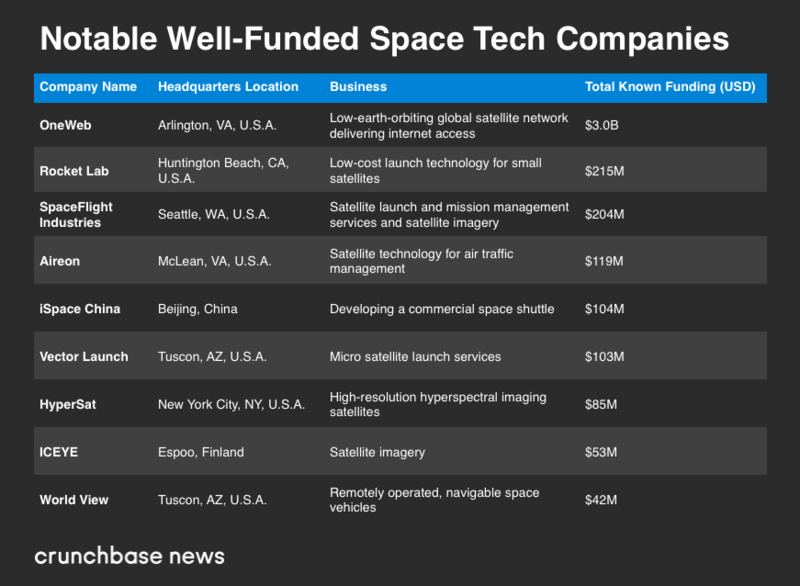 The latest example of high-velocity funding is satellite internet startup OneWeb, which recently announced a galactic-sized $1.25 billion venture funding round in the wake of a successful launch. The financing, which included a long investor list featuring the ever spendy SoftBank, brought total funding for the Arlington, Va. company to a whopping $3.4 billion. But OneWeb is far from the only space tech company to secure a big round recently. A Crunchbase News roundup of large investments in the sector unearthed a sizable list of companies attracting attention and big checks from venture capitalists, with at least a half dozen securing rounds of $50 million or more since 2018. What’s the draw? Largely, it’s the oft-repeated tale of a startup sector seeing valuations rise as early-stage companies mature, said Chad Anderson, CEO of investor group Space Angels. Now, the crop of space tech companies that launched five or six years ago is middle-aged by startup standards and ripe for larger, later-stage rounds. Economics of satellite design and launch have also become a lot more compelling for investors in recent years. Whereas satellites previously cost hundreds of millions (or even billions) to design, manufacture, and launch, today a small satellite can be built for tens of thousands of dollars and launched for a few hundred thousand dollars, Anderson said. Venture capitalists seem to like that math. Over the past 10 calendar years, Space Angels estimates that venture capital funds have invested nearly $4.2 billion into space companies. Of that total, 70 percent was deployed in the last three calendar years. More firms are getting into the space, as well. Currently, Anderson calculates that just over 40 percent of the Top 100 venture capital firms now have at least one space investment. Their investments are concentrated in two areas: satellites and launch technology, particularly for the small satellite space. While space tech is generating a lot of venture investment, however, not a lot of startups have yet made it to exit. That’s not entirely surprising, if we presume that typical venture startup-to-exit timelines apply. If the current crop of funded startups launched in the 2013 time frame, we’d expect to see exits pick up in a few years. It is worth noting, however, that the one most famous and pioneering of the current crop of venture-backed space companies, Elon Musk’s SpaceX, has also stayed private. Certainly SpaceX has the name recognition and track record to support a blockbuster IPO. Yet Anderson contends that’s unlikely to happen — at least not for a very long time. For one, Musk has laid out the company’s ultimate goal as colonizing Mars. That doesn’t jibe well with the typical public company duties, like meeting quarterly numbers. It doesn’t help that Musk has already gotten into hot water with regulators for his approach at Tesla. Yet as SpaceX pursues its grand ambitions, the company has also served as a launchpad for a number of other space tech entrepreneurs — we put together a list of nine startups with a SpaceX alum as founder or core team member. So while colonizing Mars remains a risky bet, the odds in favor of blockbuster space tech exits on Earth are getting a lot higher. *Planet and SpaceX are Space Angels portfolio companies.